Transgastric route is one of the most major accesses in NOTES. 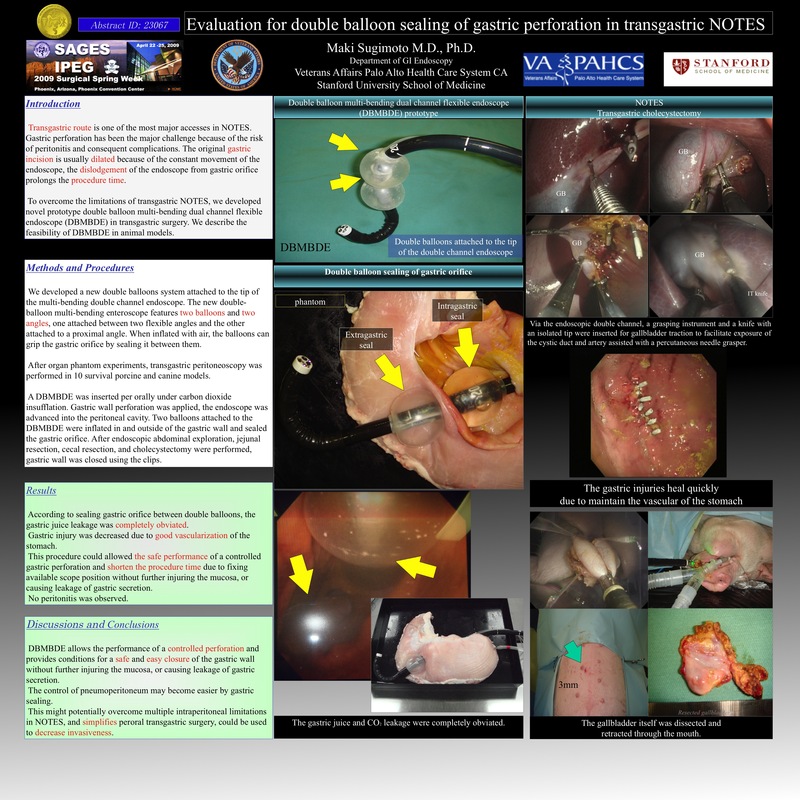 Gastric perforation has been the major challenge because of the risk of peritonitis and consequent complications. The original gastric incision is usually dilated because of the constant movement of the endoscope, the dislodgement of the endoscope from gastric orifice prolongs the procedure time. To overcome the limitations of transgastric NOTES, we developed novel prototype double balloon multi-bending dual channel flexible endoscope (DBMBDE) in transgastric surgery. We describe the feasibility of DBMBDE in 14 survival animal models. We developed a new double balloons system attached to the tip of the multi-bending double channel endoscope. The new double-balloon multi-bending enteroscope features two balloons and two angles, one attached between two flexible angles and the other attached to a proximal angle. When inflated with air, the balloons can grip the gastric orifice by sealing it between them. After organ phantom experiments, transgastric peritoneoscopy was performed in 10 survival porcine and canine models. A DBMBDE was inserted per orally under carbon dioxide insufflation. Gastric wall perforation was applied, the endoscope was advanced into the peritoneal cavity. Two balloons attached to the DBMBDE were inflated in and outside of the gastric wall and sealed the gastric orifice. After endoscopic abdominal exploration, jejunal resection, cecal resection, and cholecystectomy were performed, gastric wall was closed using the clips. According to sealing gastric orifice between double balloons, the gastric juice leakage was completely obviated. Gastric injury was decreased due to good vascularization of the stomach. This procedure could allowed the safe performance of a controlled gastric perforation and shorten the procedure time due to fixing available scope position without further injuring the mucosa, or causing leakage of gastric secretion. No peritonitis was observed. DBMBDE allows the performance of a controlled perforation and provides conditions for a safe and easy closure of the gastric wall without further injuring the mucosa, or causing leakage of gastric secretion. The control of pneumoperitoneum may become easier by gastric sealing. This might potentially overcome multiple intraperitoneal limitations in NOTES, and simplifies peroral transgastric surgery, could be used to decrease invasiveness.